Kern Memorial United Methodist Church - Oak Ridge, Tn | We would like to offer you Christ! Come as you are for a real encounter that will change your life. Dan delivered the message "Praise and Panic" at the 11 am service on April 14th. This message is now available. Click on the Subscribe button in the right column to hear this and other sermons. Then click on the Sermon title to access the file. 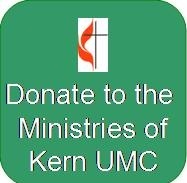 You can also listen on iTunes by clicking on the Kern UMC Sermons link under the pulpit. Great news! Kern has been accepted in the Kroger Community Rewards Program. If you have a Kroger Plus card, you can now enroll your card so that Kern will receive a donation each time you shop at Kroger. You can go to http://krogercommunityrewards.com/ to enroll your card or stop by the church office to enroll your card for "Kern United Methodist Church". Please contact Mike Cox if you need assistance. If you do not have a Kroger Plus Card, it would be a great time to get one, and sign it up for Kern. See the Youth page for updates on Youth activities. We are created to worship and serve the Creator. The Bible is the authoritative word of God for the people of God. Salvation comes from a relationship with the resurrected Jesus Christ.